Industrial hygiene is the study and art of anticipating, recognizing, evaluating, and controlling occupational and environmental health hazards. At J.E. Spear Consulting, your safety and industrial hygiene experts, are committed to protecting worker health. J.E. Spear Consulting is a proud member of the American Industrial Hygiene Association (AIHA). • Conducted a plant-wide industrial hygiene review of a facility that manufactures piping and related products. The review included defining similar exposure groups (SEG) by department and task. Qualitative and/or quantitative exposure assessments were conducted for each SEG. • Modeled potential exposures to volatile organic compounds (VOCs) for painting exposure scenarios inside confined and enclosed spaces. Also, calculated airborne concentrations of VOCs for a paint booth exposure scenario to determine if the specified ventilation rate was adequate for the products at the anticipated painting application rate. • Conducted industrial hygiene sampling studies involving hexavalent chromium, welding fumes, silica, organic vapors, isocyanates, asbestos, benzene, carbon monoxide, formaldehyde, inorganic acids, sodium hydroxide, and various other analytes. • Conducted indoor air quality and mold assessment surveys for various types of buildings including office and commercial buildings, residential homes, warehouses, hospitals, and educational institutions. Environmental parameters included mold and bioaerosols, temperature, relative humidity, carbon dioxide, carbon monoxide, ultrafine particles, formaldehyde, and volatile organic compounds (VOCs). • Conducted heat stress evaluations at a facility in Kansas for a Fortune 500 electronics manufacturing company as well as other manufacturing and construction workplaces. • Prepared a Best Practices Guide on Heat Illness Prevention and drafted a corporate standard on heat stress for a Fortune 100 company. Prepared heat illness prevention training materials for employees and supervisors. • Prepared mold management plans for facilities such as hospitals, apartment complexes, manufacturing facilities, warehouses, commercial buildings, and retail establishments. • Prepared mold remediation protocols and performed post-remediation clearance assessments for various project types including offices and commercial buildings, college classrooms, storage rooms, and residential buildings. 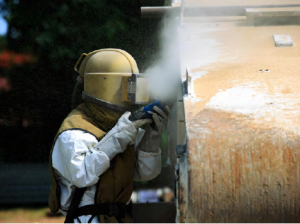 • Conducted industrial hygiene sampling for respirable dust and crystalline silica during abrasive blasting activities performed on tanks, vessels, and various other structures. Such exposure assessments have been performed at multiple work sites, which involved the use of various different abrasive blasting media. • Conducted industrial hygiene sampling for organic vapors during coating and painting applications of tanks, vessels, and other structures. Such exposure assessments have been performed at multiple work sites, which involved the application of numerous different paint and coating products. • Prepared lead compliance plans for bridge demolition and replacement projects located in California. • Performed safety planning and management oversight for a project involving weld repairs and modifications to wind tunnels (coated with lead-based paint) at a NASA facility in California. • Conducted industrial hygiene training for supervisors and managers of a world-wide engineering and construction firm. Topics covered included the recognition, evaluation, and control of chemical agents and physical agents (such as noise, heat/cold stress, etc.). • Developed a Hydrogen Sulfide (H2S) Exposure Control Program for two petroleum terminals located in Panama. The project included an on-site assessment of both terminals to evaluate current work practices. The H2S program addressed both contractors and employees with potential H2S exposure including crude oil transfers, gauging activities, sample collections, and work on or in tanks or structures that previously contained crude oil. • Assessed confined space hazards prior to entry into tanks and vessels at various petrochemical work sites. On-site assessments included performing atmospheric testing for carbon monoxide, hydrogen sulfide, oxygen levels, flammable gas, and other potential atmospheric hazards. Developed and reviewed safety plans and procedures to mitigate potential confined space hazards. • Prepared a Best Practices Guide on Respiratory Protection and a companion Powerpoint training program on respiratory protection for a world-wide Fortune 100 company. • Provided consultation on heat stress monitoring and control for a steel erection company performing welding operations inside a confined space during a turnaround project at a petroleum refinery in Illinois. • Prepared asbestos and lead operations and maintenance plans. • Provided oversight and assisted in the preparation and planning of a mold remediation project involving the remediation of a wine cellar at a residential home and cleaning over 7,000 mold-contaminated wine bottles. • Prepared remediation protocols, project oversight, and post-remediation clearance assessments for an apartment unit and off-site storage unit involving bacterial contamination that resulted from a sewer backup, which impacted both building materials and the occupants’ personal belongings. • Conducted baseline indoor air quality testing at a United States Coast Guard Station in accordance with the U.S. Green Building Council Leadership in Energy and Environmental Design for New Construction and Major Renovations (LEED-NC) Rating System. • Prepared and reviewed lead compliance plans for various bridge replacement and construction projects in California. • Prepared a lead compliance plan and provided safety management oversight, including exposure monitoring for lead, for weld repairs performed on a wind tunnel coated with lead-based paint in California. • Performed Lead Competent Person training and industrial hygiene air sampling at tank repair job sites in Panama and Honduras. 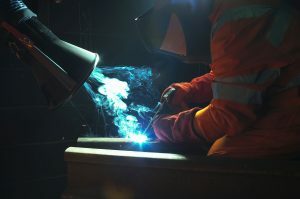 • Performed classroom and hands-on welding fume sampling training for health and safety professionals in the United Arab Emirates (UAE) and Bahrain.